A danse macabre on the futility of human greed... "'My name is Ozymandias, king of kings! Look upon my works, ye Mighty, and despair!' Nothing beside remains. Round the decay Of that colossal wreck, boundless and bare The lone and level sands stretch far away." --Percy Shelley,"Ozymadias" I can think of no better quote than the above to sum up what has to be the closest film to horror that I have yet seen by the late, great master, Akira Kurosawa. 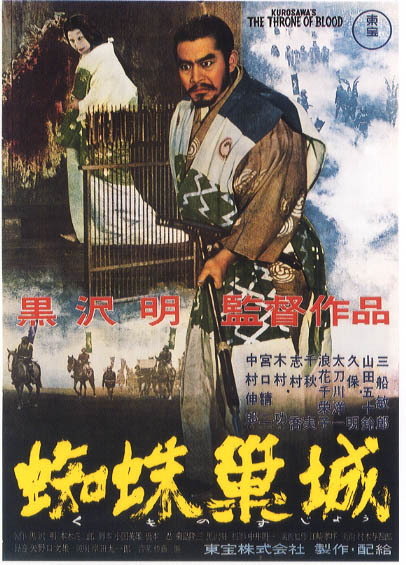 The opening sequence alone, with it's haunting dirge, tells how "Throne of Blood" will end. It's just a question of how Washiza gets to that point. The supernatural elements are strong throughout the film (and eeriely believable), but they do not overshadow the all-too believable elements of human pettiness and greed. The true horror of this film is not that it happens to include dark omens, dire prophecies, and perhaps one of the most malicious evil spirits on record. It's true horror lies in the uncomfortable, unshakable truth of what man's ambition can lead him to. 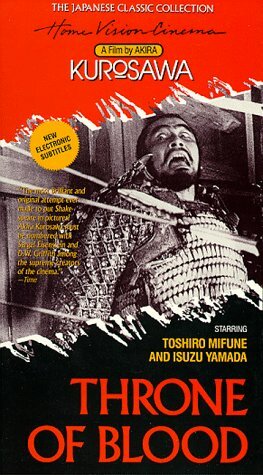 Kurosawa wisely dispensed with or downplayed most of the events in Shakespeare's original that do not include the central figure of Macbeth, which allowed him to amplify the meanings of the earlier work. Toshiro Mifune is our tour guide on this slow crawl into madness. Though he is excellent in the role, the scene that stays the most in my mind is not about him, but his scheming, power-hungry wife, Asaji. Endlessly, she washs her hands of the blood that she touched the night the master of Cobweb Castle was slain. Though her hands are spotless, she can't keep out the smell of the blood--blood that she helped to spill. If nothing else, "Throne of Blood" reiterates something many a good horror writer has said before: man can be the greatest monster of them all.